Heading to an industry conference? Why not schedule meetings with your potential clients before you fly out? DeviceAtlas launched a lead generation page to do exactly this. The entire goal of this page is to get interested prospects to book a meeting with the brand during their time at the Mobile World Congress event. Clever event-based campaign: This campaign makes great use of DeviceAtlas’ investment in attending this industry event. In-person conferences are a huge lead source, and now this brand can followup with interested prospects in person, and again after returning home. A lead gen campaign like this ensures they make the most of their allotted marketing budget for in-person events. One, clear call to action. Although this CTA could use some added context, it is clear that entering your email address books you a meeting with DeviceAtlas representatives at the conference. There’s also only one action a visitor can perform while on the page (i.e. enter their email address), and this increases the likelihood of conversion. Location of the copy. When you first arrive on this page, it’s difficult to discern the overall context. If the copy below the call to action was featured above the form, visitors might immediately understand the context for signing up for a meeting. Headline copy. 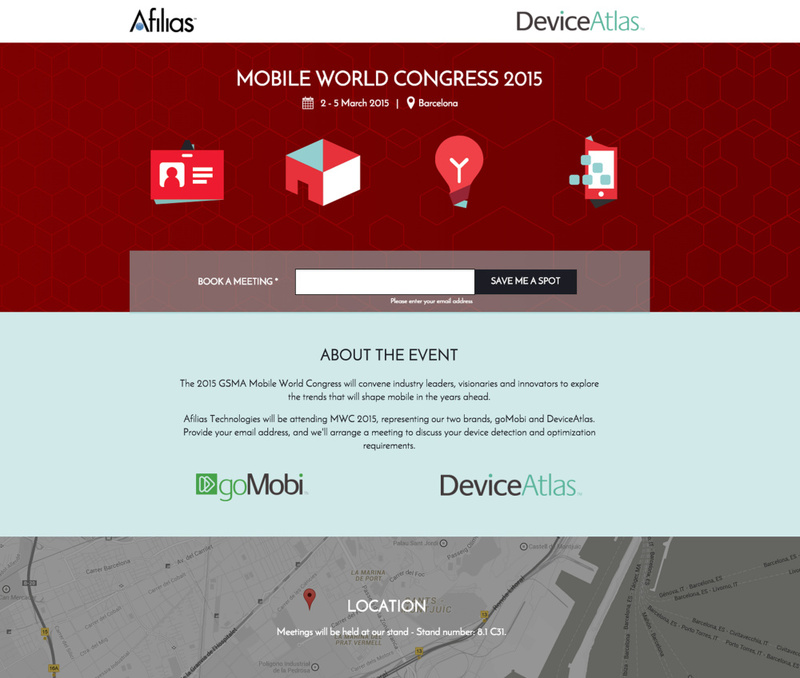 Instead of simply using the event title, it might be best to use, “Meet with DeviceAtlas at the Mobile World Conference”. This clarifies what’s being offered on the page right away. The images. While it might be difficult to score an image from a past Mobile World Conference, it’s best you try to evoke the conference best you can. A quality stock photo of a conference space, people meeting at a conference, or even a photo of your brand’s booth at the conference would have conveyed the context of this landing page offer more clearly.